Japan is currently being washed by a typhoon. The word typhoon comes from the Japanese 台風 台 (tai) meaning pedestal or stand, and 風 (fu) wind. The typhoon season is from May until October with most hitting the islands in the southern regions of Okinawa. The typhoons are most powerful in August and September. Typhoons are cause by large areas of low pressure they move at a slow speed (20km/h) which means their paths can be predicted quite easily. The Japanese system numbers the typhoons instead of naming them like the American hurricanes. This is the fourth typhoon of the season earning it the title 台風4号 (taifuu yon gou). 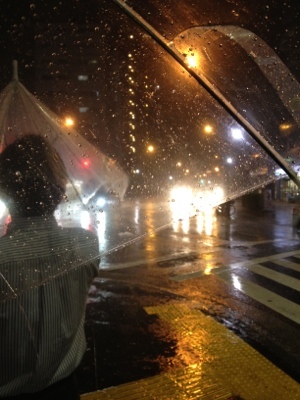 As Japan is long and thin when a typhoon does travel all the way up to the north it usually affects the whole country. Fatalities occur usually due to landslides and falling debris. Over 4000 people were killed, 32,000 injured and over 1.5million displaced when the worst ever typhoon hit Japan in 1959.